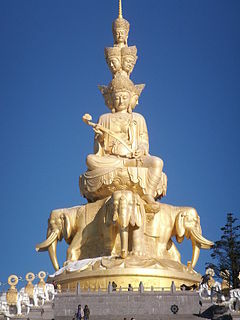 Samantabhadra (Sanskrit: समन्तभद्र; lit. "Universal Worthy") is a bodhisattva in Mahayana Buddhism associated with practice and meditation. Together with Gautama Buddha and his fellow bodhisattva Mañjuśrī, he forms the Shakyamuni trinity in Buddhism. He is the patron of the Lotus Sutra and, according to the Avatamsaka Sutra, made the ten great vows which are the basis of a bodhisattva. 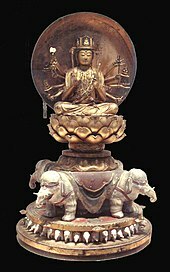 In Chinese Buddhism, Samantabhadra is known as Pǔxián and is associated with action, whereas Mañjuśrī is associated with prajñā (transcendent wisdom). 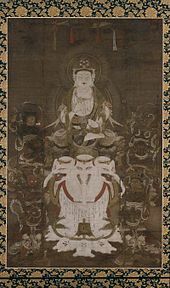 In Japan, this bodhisattva is known as Fugen, and is often venerated in Tendai and Shingon Buddhism, and as the protector of the Lotus Sutra by Nichiren Buddhism. In the Nyingma school of Tibetan Buddhism, Samantabhadra is also the name of the Adi-Buddha – in indivisible Yab-Yum with his consort, Samantabhadrī. Unlike his more popular counterpart Mañjuśrī, Samantabhadra is only rarely depicted alone and is usually found in a trinity on the right side of Shakyamuni, mounted on a white elephant. In those traditions that accept the Avatamsaka Sutra as its root instruction, Samantabhadra and Manjusri flank Vairocana Buddha, the central Buddha of this particular sutra. Known as Pǔxián in Chinese, he is sometimes shown in Chinese art with feminine characteristics, riding an elephant with six pairs of tusks while carrying a lotus leaf 'parasol' (Sanskrit: chatra), bearing similar dress and features to some feminine depictions of Guanyin. It is in this guise that Samantabhadra is revered as the patron bodhisattva of the monasteries associated with Mount Emei in western China. Some believe that the white elephant mount of Samantabhadra was the same elephant that appeared to Queen Maya, the mother of the Buddha, to herald his birth. 'The Mirror of the Mind of Samantabhadra' (Tibetan: ཀུན་ཏུ་བཟང་པོ་ཐུགས་ཀྱི་མེ་ལོང, Wylie: kun tu bzang po thugs kyi me long) is one of the Seventeen Tantras of Dzogchen Upadesha. Sri Lankan people venerate Samantabhadra Bodhisattva as Saman (also called Sumana, Samantha, Sumana Saman, Sinhalese: සුමන සමන් ‍දෙවි). The name Saman means "the rising morning sun". The god Saman is considered to be one of the guardian deities of the island as well as a protector of Buddhism. His main shrine is located in Ratnapura, where there is an annual festival held in his honor. ^ Katō Bunno, Tamura Yoshirō, Miyasaka Kōjirō, tr. (1975), The Threefold Lotus Sutra : The Sutra of Innumerable Meanings; The Sutra of the Lotus Flower of the Wonderful Law; The Sutra of Meditation on the Bodhisattva Universal Virtue. New York & Tōkyō: Weatherhill & Kōsei Publishing. ^ "The Gods & Deity Worship in Sri Lanka". Retrieved 2010-06-28. Dudjom Rinpoche; Jikdrel Yeshe Dorje (1991). Translated and edited by Gyurme Dorje with Matthew Kapstein (ed.). The Nyingma School of Tibetan Buddhism: its Fundamentals and History. Two Volumes. Boston: Wisdom Publications. ISBN 0-86171-087-8.